Many years ago we left the platform at LaPlata, Missouri, and headed east on an Amtrak train bound for Vermont. I had signed up for a cheesemaking workshop taught by Margaret Morris at a small sheep dairy there. It was a great class and it gave me more confidence to try my hand at hard, aged cheeses. What it didn’t give me, though, was more time. So, one of my goals is to use the milk that Julia produces every day more effectively. I’m good about making butter and yogurt on a regular basis, but I’d let the art of making aged cheeses slip away from me last year. Every week since school’s been out, I’ve fired up a double-boiler stock pot system so I can make cheese. I’ve scaled down my efforts a bit. Instead of trying to use five gallons at a time (for a five-pound wheel of cheese), I’m using two gallons at a time. The advantage is that the process goes a bit more quickly, and the pot of milk is definitely easier to deal with. 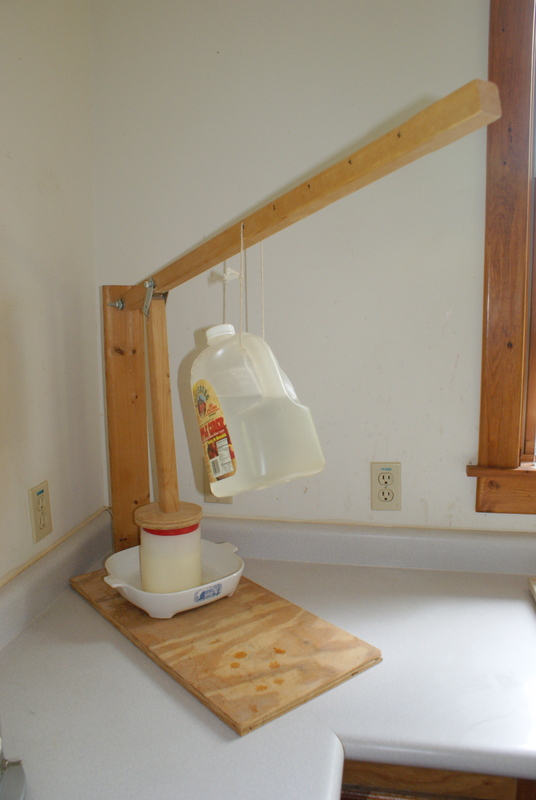 Hoisting forty pounds of warm milk out of a hot bath is not an easy trick. The process of heating the milk, adding culture, rennet, cutting the curd, stirring the curd and then molding the curd, takes about four hours in total. 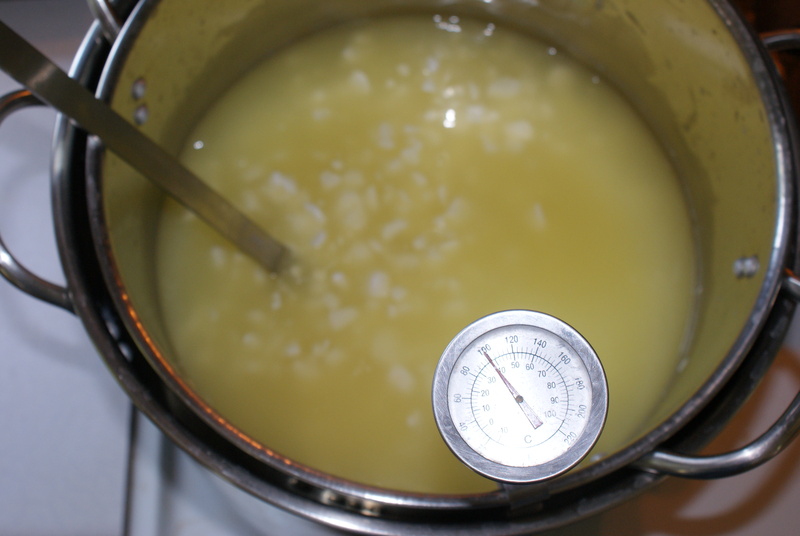 A lot of that time is spent stirring slowly and heating the milk by two degrees every five minutes. Not the type of thing you can just walk away from. But, I’ve managed to produce three nice little wheels of a sweet smelling cheese. 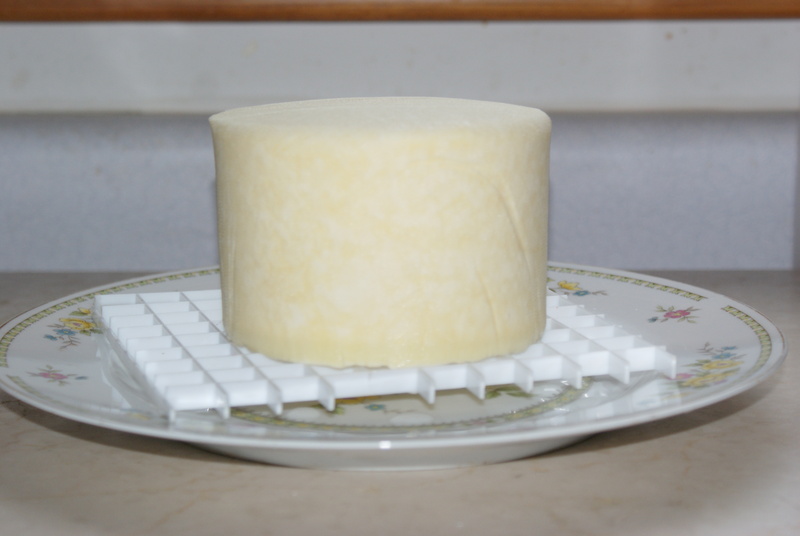 Once the rounds have been brined in a salted bath, and the rind has had a chance to air dry for a couple of days, I rub the cheese with a light coat of olive oil and set it into an old laboratory refrigerator set at 57 degrees. Every week they get turned, and in two months I’ll cut one open to see how it’s turned out. The recipe I’m using is a hybrid of one from Ricki Carroll’s book Home Cheesemaking and Margaret Morris’s The Cheesemaker’s Manual. Both are excellent resources. 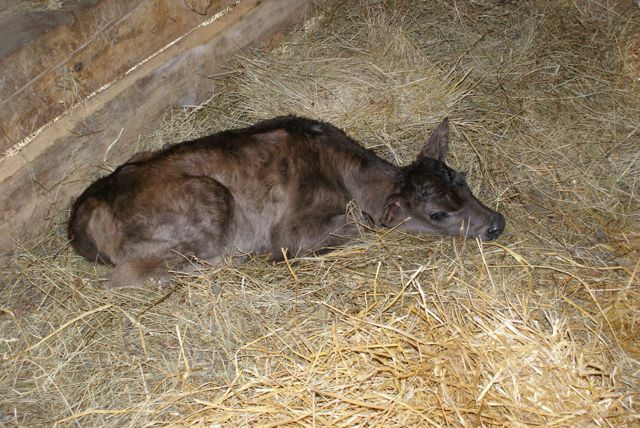 Last night, while thunder rumbled and lightning popped across the sky, Julia gave birth to her second calf. This time she had a heifer. Because the heifer is a Jersey/Angus cross, she’s about the size of a small labrador retriever. She’s also a dark chocolate brown. This morning I fed Julia some grain and tied her loosely in her stall. While she ate, I milked out about a quart of colostrum. The little one had taken the rest. Then John and I got the stall cleaned up, rebedded, and properly fluffed. Julia seems quite contented in her stall, keeping watch over her new baby. 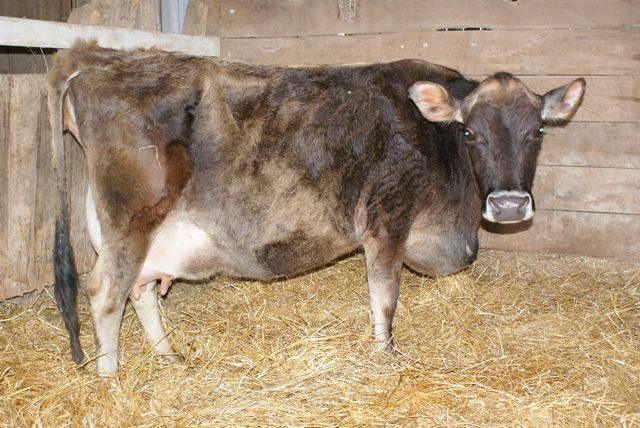 Looks like she'll produce quite a bit of milk for us this year. Here's the latest addition to our farm, all hunkered down and sleepy after a big breakfast.